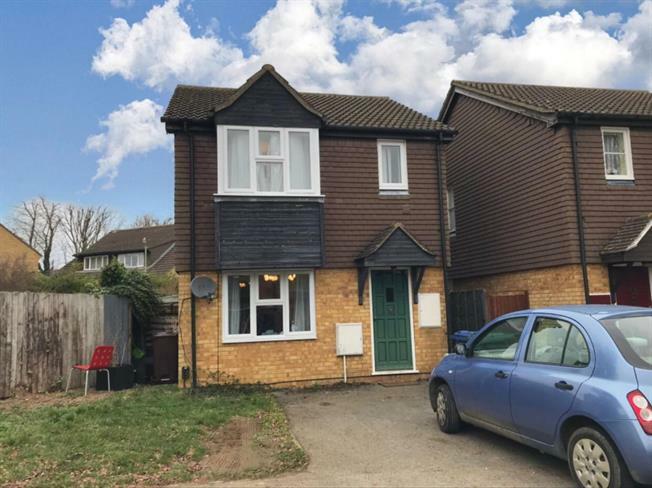 3 Bedroom Detached House For Sale in Bicester for Asking Price £300,000. Taylors Estate Agents are delighted to offer for sale a well presented three bedroom detached family home in bicester. The property comprises of entrance hall, lounge/diner and kitchen to the ground floor. The first floor comprises of two double bedrooms, one single bedroom and three piece family bathroom. Outside the property boasts enclosed rear garden that has been designed by well known landscaped designers, side gated access leading to the front of the property with single garage and driveway. Double glazed uPVC window facing the rear overlooking the garden. Part tiled walls. Roll top work surface, wall and base units, single sink with mixer tap and drainer, integrated electric oven, gas hob and over hob extractor. UPVC patio double glazed door, opening onto the garden. Double aspect double glazed uPVC box bay windows. Double aspect double glazed uPVC windows with frosted glass facing the rear and side overlooking the garden. Radiator. Low level WC, panelled bath, pedestal sink.